At CRL, we focus on providing exceptional services in the field of subspecialty teleradiology. Our radiologists represent all imaging subspecialties, including breast, body, diagnostic, interventional, neuroradiology, interventional neuroradiology, musculoskeletal, and nuclear medicine. With our subspecialty teleradiology consulting services, you can expect to build a strong relationship with our radiologists, as well as efficient and expedited consultation. Relationship – Your clinicians and staff will build a strong relationship with the CRL radiologist assigned to your healthcare facility. Our radiologists are friendly, helpful, and professional and committed to providing quality radiology services. Immediate Consultation – In the event of emergencies, the hospital clinicians are able to consult immediately with the CRL radiologist. Typically a 30 minute turnaround for STAT exams is our standard and reports are available immediately on our workplace enterprise, CRTIS, or imported directly into your EMR/EHR. In addition to these benefits, outsourcing your subspecialty teleradiology services with CRL will allow for efficient and accurate diagnosis. Quality – CRL has an extensive quality assurance program. As a member of Radpeer CRL benchmarks our quality assurance program against other national radiology providers, peer reviewing over 30,000 cases annually. CRL also provides a workplace enterprise for customers with HL7 integration to provide electronic reports directly to the electronic medical records of a hospital or clinic. Our teleradiology systems are centered on productivity and efficiency for our hospital partners and radiology departments. CRL’s breast imaging services include virtual diagnostic mammograms, which allow for immediate consultation for our clients in instances where additional photos may need to be taken after an initial mammogram. Because these virtual diagnostics can be performed within the same appointment, clinics and hospitals can expect an increase in rate of compliance for follow up diagnostic exams, as well as the saving of time and money for themselves and their patients. When hospitals or clinics are looking for subspecialty interpretations the solution may be to outsource those interpretations. 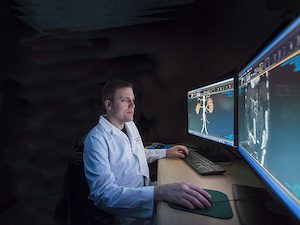 CRL is a full service, sub-subspecialty radiology practice with fellowship trained radiologists in musculoskeletal, breast imaging and neuroradiology who are also CAQ certified. By enlisting CRL’s teleradiology services a hospital or clinic can expand the overall quality and effectiveness for their patients. Contact us today to get started on outsourcing your subspecialty teleradiology services with CRL. We promise a 30 minute average turnaround time for our emergent diagnostic interpretations. Do You Provide Data for Quality Assurance and Turnaround Times? Yes. We provide comprehensive reporting on our operations, including analytics for QA and turnaround time. How Long Has CRL Been Providing This Subspecialty Teleradiology Services? CRL has been providing teleradiology and subspecialty interpretations for our hospital partners since 2005. Do You Have Longevity with Radiologists? Yes, as a regional provider we remain consistent with our teleradiologists. During the term of a radiology agreement our hospital and clinic partners can expect to work with the same radiologist(s) building a true partnership which ultimately leads to better patient outcomes.